Leoris is very well traveled, having traveled along side his family in his youth and alone as a merchant in his adulthood. During his travels, he has studied the art of blacksmithing with a variety of tradesmen, honing his skills. He is a gentle soul, who prides himself on being fair and kind to all. 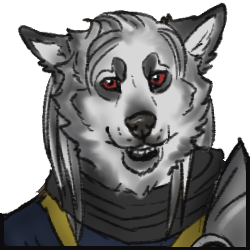 As a merchant, he has dealt with a wide variety of canines and has learned how best to choose his words and keep his temper in check, as such, it is a particularly difficult task to push his buttons! This wolf believes that, through hard work and acts of kindness, anything is possible, just ask and and you will have a helping paw in an instant. During his travels through Nova Scotia in August 2017, he had goods stolen from him by the Syndicate. After tracking the gang down, in an effort to get back his goods, Leoris stumbled upon the gang marching to attack a nearby pack, Casa di Cavalieri. Abandoning his mission, he selflessly warned Casa of the approach and assisted in the battle, ultimately deciding to stay and aid the pack's recovery afterwards. Leoris was the son of merchants, and thus spent his young life traveling. When he became an adult, he joined in the trade and eventually started his own blacksmithing wares traveling shop away form his parents. He traveled across Canada, stopping only a few times to learn from blacksmiths and hone his skills. After three years of this, his wares were stolen from him while visiting Halifax, Nova Scotia. He tracked down the thieves only to learn that they were joining a larger group called Syndicate, and they were marching towards a pack's territory. Selflessly, he gave up the pursuit of his goods to run ahead and warn Casa di Cavalieri. Joining in on the fight, he spent some time in the pack recovering. During this time, he realized that he wanted to support the Cavaliers in their mission of justice and helping others. As a member of Casa, he learned more about blacksmithing from Grynn Garcia-Knight, eventually becoming one of the pack's main blacksmiths after her departure. Jovial: Leoris always has a smile on his face. He prefers to look at the good in any situation at hand. There is a bit of a bounce in his step. He is a lighthearted soul who loves to spread joy. Honest and Fair: He believes strongly that, for good things to happen around you, you must be honest and fair. In his life, he is trying his best to be truthful and make god decisions based on facts. Kind and Helpful: Leo is forever eager to help those around him, it is this quality that caused him to help Casa fight the Syndicate and stay after to help with the clean up. He will always put others' needs above his own. Along the same lines, he would never use words to hurt others, only bring them up. Blacksmithing: Leoris has been blacksmithing since he was a yearling, learning from a variety of blacksmiths in his travels and ultimately settling down in Casa and learning more from Grynn Garcia-Knight. He is able to sharpen and restore blades, as well as create smaller, basic metal armor such as shoulder and shin pieces. Trading: Due to his travels with merchant parents, and running his own traveling shop until 2017, Leoris has learned how to get a good deal with kindness. When needed, he can put an uncharacteristic heavy foot down to get the right deal. Weapon: Leoris uses a studded mace when fighting. Due to his joyful and kind nature, he has many friends inside of the pack.